In your town, or soon to be headed there, no matter how big or small that town might be, there are people considering going (or going back) to church. In short, people are looking for your church. The first impression your church makes will be its website. Have a website? That’s a great first step in connecting with those people. But, at FaithStreet, we know that most church websites are heavy on info and low on hospitality. That’s why we created the Plan Your Visit button. In one simple and elegant experience, The Plan Your Visit button transforms your website from a static collection of content into a platform for connection. Go to your church’s dashboard. Click ‘Directory’,‘Interested in Visiting’ and ‘Add to your website’. Copy the HTML and paste it in your website’s HTML editor. Interested visitors will use the button to connect with you in a friendly, low-pressure way. 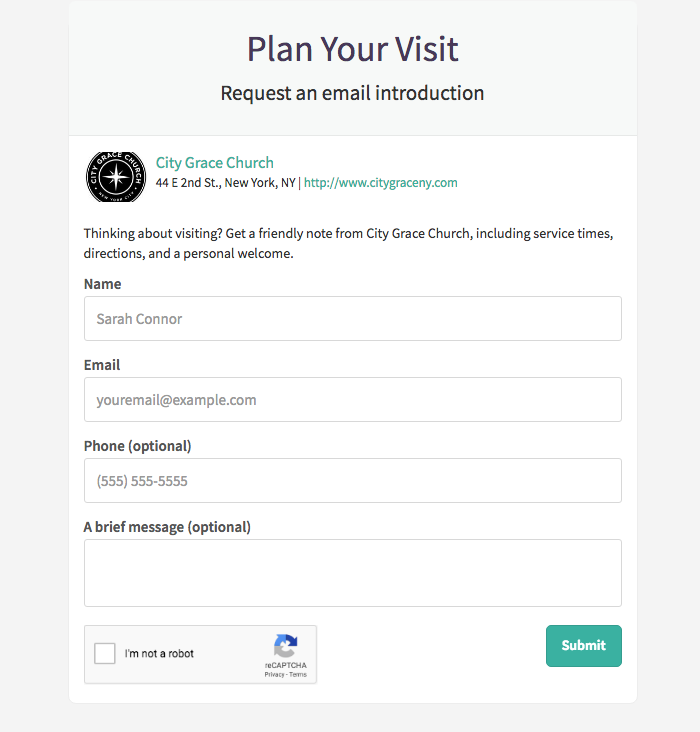 The button links to a customized page for your church. The visitors who come are tracked in your FaithStreet admin dashboard. Simple, effective outreach. It’s always been part of our DNA at FaithStreet. Add the button to your website today. Need help? Our team can do it for you. FaithStreet has created a free, online tool to help you increase pledge participation. It’s called Pledges, and you can find it under the Goals tab in your FaithStreet dashboard.